Lowdown: A dramatization of the GFC’s moment of no return. I seem to have a soft spot for films focusing on capitalist pigs / extreme neoliberals at work. Even though they hardly ever turn out to be great (Wall Street and its sequel are probably the most famous examples), they still appeal to that “I knew better” ego of mine. Now we have Margin Call entering the scene, packing not that much in originality but much more in the famous actors doing strong supporting roles department. The whole movie takes place over two days, the day before and the day after the GFC came into our lives. Its stand is made very clear very quickly, with us being shown how an investment bank – in which the whole film takes place – fires the bulk of its employees for very Darwinian reasons. Its implementation of this Enron style (and, as recently exposed, Microsoft style, too) policy includes getting rid of previously devoted employees who worked for the company for the bulk of their adult life. One such employee, a department manager (Stanley Tucci) was onto something big when he’s escorted out the building and finds his mobile disconnected. His last move as a company employee is leaving a USB stick to one of his employees (Zachary Quinto). The latter, one of the few to survive the employment massacre, manages to finish his former boss’ work and thus realize the bank – and the entire economy – is on the brink of collapse. Alerts go up the food chain of managers (including, but not limited to, Paul Bettany, Kevin Spacey and Jeremy Irons). They all have their ideas of how the bank can survive the calamity that is to come, with the more ethically oriented (Spacey) to one side and most of the rest to the other. 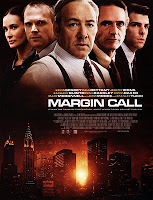 The outcome is known to us all; where Margin Call puts its focus is on the human drama and character interactions. Best scene: Kevin Spacey goes out with a motivation speech to his remaining employees, following the redundancy wave. He starts by getting all of them to clap and be cheerful about it and their future prospects, demonstrating an extreme but not an unheard of mechanism by which companies apply spin to their employees so that the latter can be further exploited. Overall: Some fine drama, some nice performances by nice big names, but no brilliance. 3 out of 5 stars.